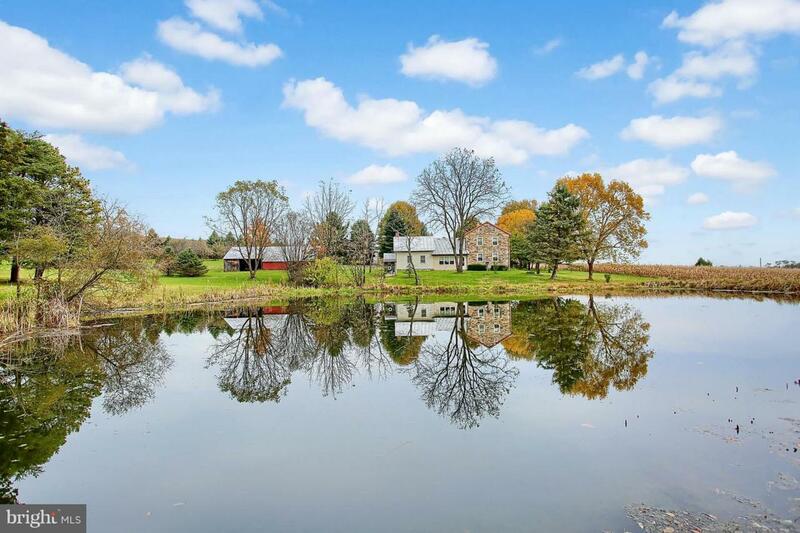 Fantastic, Picturesque 43 Acre Farm/Estate sitting at the base of Blue Mountain. Estate boasts the original and now updated early 1800s Stone Farm House with two working walk in fireplaces (a must-see!) and much, much more! This Carlisle area working Farm comes complete with a 40x60 ft 1800s PA Bank Barn with 16x40 covered machine shelter, 26x60 machinery storage building and a 32x60 Garage/Shop/Office building. Grounds have two ponds, a stream and a well maintained 2000 ft gravel driveway to a State Highway. Solar Panel electric generation system that powers the whole farm. Small orchard and large part of Farm has corn. Great place for horses or any livestock you want to raise. Sale is for 43 Acres and all buildings. Entire tract is 143.6 Acres. Much more info in associated documents. Don't miss this opportunity to own a little piece of Heaven now!